A British government minister was apparently so dedicated to her work that she spent a “family holiday” in Israel conducting 12 undisclosed meetings with Israeli officials, including prime minister Benjamin Netanyahu. Those covert meetings brought about the downfall of Priti Patel on Wednesday night. She was forced to resign as international development secretary, responsible for Britain’s overseas aid budget, admitting her actions “fell below the standards of transparency and openness” expected of a minister. Her position became untenable as further revelations this week showed she had held two additional unrecorded meetings with Israeli officials in London and New York in September, organised and attended by a prominent Israel lobbyist. All meetings conducted by British ministers on official business are supposed to be recorded by government civil servants. Although the office of Theresa May, the British prime minister, has insisted it did not know of these meetings until the BBC revealed them on November 3, a report from Britain’s Jewish Chronicle newspaper suggested otherwise. It claimed that, while the meetings were not authorised beforehand, May’s officials learnt of them almost immediately through Israeli counterparts. During her vacation in Israel, Patel also dispensed with sightseeing to head instead to the Golan Heights, Syrian territory illegally occupied by Israel since 1967. Thoughtfully, the Israeli army accompanied her and had the chance to explain in detail their “humanitarian work” running a field hospital patching up those injured in southern Syria, including al Qaeda combatants. Patel was reportedly so impressed she wanted to give the Israeli army a chunk of Britain’s limited international aid. Her department’s budget is apparently so tight that, according to the Independent newspaper, she approved cuts last year in aid to the Palestinians of £17 million, including projects in Gaza. In other words, Patel hoped to give British aid intended for the most unfortunate directly to one of the best-funded and equipped armies in the world, one that already receives $4 billion a year in military aid from the United States, and which has used its swollen budget to sustain a five-decade belligerent occupation of the Palestinians and enforce its continuing occupation of the Syrian Golan. All of this was done unofficially. In an example of under-statement, the British media called all of this a “breach of ministerial protocol”. The Guardian newspaper characterised Patel’s behavior as a sign of her “incompetence”. But is that plausible? Was Patel so astoundingly ignorant of government protocol that she held meetings off the books with senior Israeli officials? Was it political naivety that led her to venture into the Golan under the auspices of the Israeli army and into an area from which Israel has been deeply meddling in the six-year Syrian proxy war raging just a few miles away? And was it simply a coincidence that her unusual holiday excursion occurred as analysts have begun warning of an imminent renewed outbreak of hostilities between Israel and its northern neighbors, Syria and Lebanon? It is worth picking through the debris in an attempt to work out what she, and Israel, might have been trying to achieve. Patel is a prominent member of Conservative Friends of Israel (CFI), a pro-Israel lobby group to which 80 per cent of the ruling Conservative party’s members of parliament, including most government ministers, belong. They and a similarly entrenched group of opposition Labour MPs belonging to Labour Friends of Israel (LFI) are there to advance Israel’s case in parliament and in British foreign policy. Such MPs are invited on official “educational” trips to Israel where they get access to Israeli leaders and are wined and dined. The damaging influence of these lobbies on British politics – and the covert nature of their activities – were highlighted earlier this year in a four-part undercover investigation broadcast by Al Jazeera. In the episode on the Conservative party, an Israeli embassy official was filmed plotting with party officials to “take down” a government foreign office minister, Alan Duncan. He is seen as a rare outpost of support for the Palestinians in the Conservative party. This disturbing incident was largely ignored by the Conservative leadership and the British media. Patel’s membership of CFI is hardly surprising. But her level of commitment to Israel, beyond that of her CFI membership, is suggested by the nature of her choice of “holiday” destination and the endless round of meetings she held there. They were organised by Stuart Polak, who accompanied her and is the honorary president of CFI. Patel has argued that the meetings touched on entirely innocuous topics. Netanyahu apparently took time out of his busy schedule – including his frantic efforts to staunch a corruption scandal that could lead to his resignation and jail time – to chat about Patel’s “experience growing up in an area of the UK with a thriving Jewish community” and “her political journey”. More likely, Israeli officials were keen to talk to Patel for more pertinent reasons. Some are easier to identify than others. Most obviously, Patel’s role was to oversee Britain’s aid to the Palestinian Authority and human rights groups that monitor Israel’s appalling record of abuses in the occupied territories. Patel had already proven her willingness to cut aid to the Palestinians. It was reported that in October last year she also temporarily suspended £25 million in funds to Palestine, though her department denied the story. A foreign office source told the BBC: “She has been pushing to get her hands on the PA aid budget and we have been pushing back.” Israeli officials may have hoped they could extract more concessions from her or persuade her to tie aid to greater Palestinian compliance with Israeli demands. Netanyahu has additionally been leading an aggressive campaign to silence Israeli human rights groups and prevent them from receiving foreign, mainly European, funding. In a sign of how high a priority this is, Netanyahu asked the British prime minister at a meeting in May to end Britain’s supposed funding of an Israeli army whistleblower group, Breaking the Silence. In fact, the group receives no money from the British government. 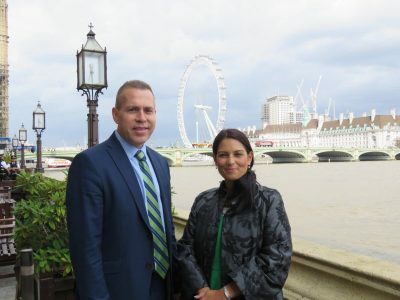 Patel’s account of her meeting with Israel’s police minister, Gilad Erdan, at least hints inadvertently at another topic that both sides may have hoped would be of mutual benefit. Notably, she met Erdan a second time at the Houses of Parliament in September, in contravention of a decision by her department officials. The meeting was arranged through her constituency office and went unrecorded. She says she discussed with Erdan the problem of antisemitism in the UK. He, meanwhile, stated in a Tweet that they spoke about ways to “counter attempts to delegitimise Israel in international institutions”. Erdan’s full title is minister of public security, communications (hasbara – or “propaganda” in English) and strategic affairs. He is charged with smearing Israel’s critics abroad and has established a “dirty tricks unit” to try to destroy the growing international BDS movement that campaigns for a boycott of Israel. Netanyahu has claimed that “delegitimisation” – criticism – of Israel is the biggest threat facing his country after an Iranian nuclear bomb. As the Al Jazeera documentary indicates, the dirty tricks campaign has often relied on Israeli embassy officials and allies in western political parties, like the most zealous members of the CFI and LFI, to weaponise accusations of antisemitism against Israel’s critics. Since Jeremy Corbyn became leader of the opposition Labour party two years ago, the British media have been flooded with stories of a supposed antisemitism crisis under his watch. In judging the plausibility of these accusations, it is hard to ignore the fact that Corbyn is the first leader of a major British political party to place the rights of Palestinians above Israel’s right to carry on regardless with the occupation. Was Patel plotting with Netanyahu and Erdan to help Israel in further damaging Corbyn, possibly by stoking yet more claims of antisemitism in his party, at time when the Conservatives have no parliamentary majority and are in a permanent state of crisis that may yet force elections Corbyn is well placed to win? And, more cynically still, as some of her fellow ministers suggested to the BBC, might the ambitious Patel have seen seeking to prove her credentials with Israel and its wealthy supporters and lobbyists in the UK, including Lord Polak, to help in a future leadership bid? If that is what these meetings were at least in part about, did Patel take on this task on her own initiative or on behalf of CFI? And was there really no coordination with the party leadership? Interestingly, when the meetings first came to light, Patel claimed that the foreign office was fully informed. Only under pressure from Boris Johnson, the foreign secretary, and May did she start backpedalling. Now, the evidence appears to indicate that May’s office too may have been engaged in a cover-up. Michael Oren, deputy minister in the Israeli prime minister’s office, reportedly told senior British government officials about Patel’s meeting with Netanyahu the day it occurred. So given this context, what can we make of Patel’s extraordinary trip to the Golan? The field hospital that so impressed her is rather more than an example of altruistic “humanitarianism” by the Israeli army. Although it is widely reported that the hospital cares for “Syrian nationals” injured in the fighting in Syria, its primary role appears to be to treat foreign fighters from al Qaeda-affiliated groups injured in battles with Syrian government forces and their Lebanese ally, Hizbullah. A significant number of wounded have been transferred to hospitals inside Israel. This barely concealed fact – it was even documented by the United Nations in 2015 – caused outrage among the Syrian Druze population living under Israeli occupation in the Golan, as well as Druze families in Israel. It looked to them like the Islamist fighters were being patched up so that they could carry on butchering Druze relatives a few miles away in southern Syria. In summer 2015 that anger peaked, and several ambulances carrying fighters to Israeli hospitals were attacked by Druze, in the Golan and Israel. In one attack masked men managed to stop an ambulance and beat a fighter to death. In September two Israeli Druze men were convicted of another, failed attempt to stop an ambulance. They face up to 20 years in jail. But in fact, Israel’s ties to al Qaeda groups and Islamic State (ISIS) in Syria extend beyond medical help. The UN reported that the Israeli army was seen transferring boxes to al-Qaeda groups in Syria. There are credible reports that Israel has also armed and trained al Qaeda fighters, and provided them with maps and intelligence. The strong suspicion is that Israel has forged links to these Islamic extremists to help them wear down Hezbollah and the Syrian army. Israel has carried out more than 100 air strikes inside Syria, all against government forces, precisely to weaken the military alliance between Iran, Syria and Hezbollah, and thereby helping al-Qaeda groups. The Islamic extremists have also received assistance from Saudi Arabia and the Gulf and less directly from the US. Why was a British minister in charge of humanitarian aid getting mixed up in all this? The episode has troubling parallels with events from 2011 when Liam Fox, Britain’s defence minister, resigned following his own murky dealings with Israel. The official grounds for Fox’s departure were that he had broken ministerial protocol by allowing a close friend and lobbyist, Adam Werritty, to attend defence meetings posing as an adviser. But in fact, Fox’s ties to Werritty were even more problematic than admitted. Craig Murray, a former British ambassador turned whistleblower, has argued that the official story about Fox was used to deflect attention from far more serious violations of government protocol. Fox and Werritty were active in a shadowy group called Atlantic Bridge that had close ties to the neoconservatives who were deeply embedded in the administration of George W Bush. The neocons openly promoted an aggressive policy designed to destabilise the Middle East, all in a bid to help Israel. The neocons had served as a long-standing pressure group for attacks on Iraq, Iran and Syria – chiefly because they were seen as bulwarks against Israel’s hegemonic influence in the region. In 2003 the neocons succeeded in persuading the Bush administration to invade Iraq, unleashing a lethal collapse of central authority there. Israel and the neocons have been trying to engineer a complementary attack on Iran ever since, and there is overwhelming evidence that they have been seeking to undermine Syria too. The most significant of Fox’s off-the-books meetings occurred in February 2011 when he and Werritty, supported by the UK ambassador to Israel, Matthew Gould, secretly met Israeli officials in Tel Aviv. According to Murray, drawing on his contacts in the diplomatic service, the Israeli officials were, in fact, Mossad agents. And the topic they discussed was Britain’s possible role in helping to create a favourable diplomatic environment for Israel or the US to carry out an attack on Iran. Separately, the Guardian newspaper revealed that Fox’s ministry had drawn up detailed plans for British assistance in the event of a US military strike on Iran. That included allowing the Americans to use Diego Garcia, a British territory in the Indian ocean, as a base from which to launch an attack. Unnamed government officials told the Guardian Fox had been pursuing an “alternative” government policy. Murray, more directly, suggested that Fox, Werritty and Gould had conspired in a “rogue” foreign policy towards Iran, against Britain’s stated aims. Although Fox was forced to resign over his links to Werritty, he was quickly rehabilitated once May became prime minister. He was appointed secretary of state for international trade last year. With fitting irony, Patel was on a trip to Africa with Fox when she was called back to the UK as the scandal deepened. Under pressure from an embattled May, she has resigned. Was Patel pursuing an “alternative” policy towards Israel or its neighbors? And if so, what was that policy, and did anyone senior to her authorise it? Her role in talking to senior Israelis bypassed the foreign office. Did she do so because officials there like Alan Duncan were not seen as sympathetic enough to Israel, and might try to sabotage it? The permanent bureaucracy of the foreign office has often been seen as holding “pro-Arab” views not unrelated to western interests in the Gulf and its plentiful oil. And how does May, a fervent supporter of Israel, fit into this picture? Given British government secrecy, it will likely never be possible to provide definitive answers. But it is worth remembering that Israel, its still-powerful neocon allies in Washington and the Saudi regime are angling for the Israeli army to reverse the decisive gains Assad and his allies have made in taking back control of Syria in recent months. This week Daniel Shapiro, a former US ambassador to Israel, wrote in the Haaretz newspaper that the Saudis were meddling yet again in Lebanese politics, forcing Hezbullah into greater political prominence, to provide the pretext for Israel to renew its confrontation with the Lebanese militia and thereby stoke a new war between Israel and Lebanon and Syria. When the time comes, Israel will, as ever, rely on well-placed friends in western capitals to support and misrepresent its actions. Until her resignation, Priti Patel would undoubtedly have been one of those prominent champions of Israel helping out in a time of need. This article was posted on Saturday, November 11th, 2017 at 6:06pm and is filed under Al-Qaeda, BDS (Boycott Divestment and Sanctions Movement), Benjamin Netanyahu, Crimes against Humanity, Ethnic Cleansing, Europe, Human Rights, Iran, Iraq, ISIS, Israel/Palestine, Jeremy Corbyn, Lebanon, Middle East, Militarism, Mossad, President Bashar al-Assad, Saudi Arabia, Syria, UK Hypocrisy, UK Media, UK Politics, United Kingdom, United States, US Hypocrisy, War.